A year on from Nier: Automata’s release, director Yoko Taro reveals that there is still one last secret for players to uncover. 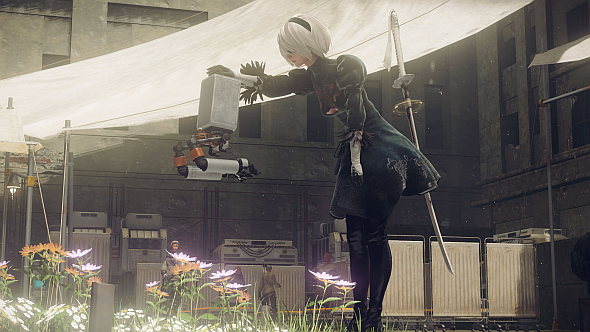 Famitsu (via Gematsu) interviewed directors Taro, Takahisa Taura and ten of Nier: Automata’s staff members to mark the game’s first anniversary. Nier: Automata’s chipset upgrades made our best game mechanics of 2017. Whether the ‘final secret’ is something simple to be found within the game or a whole new ending is unknown (that could be a reasonable thing to hope for with Nier: Automata – the game has many endings, and some of them are small goofy jokes). Later in the interview, a trick was revealed that allows players to interact with the camera. By holding down R3 and using the d-pad, you can zoom the camera in and out. However, the developers say this will cause issues with topography and bug the camera. Who knows, maybe this is part of the secret to solving the mystery.